Home » Why is Andorra the next big thing in skiing? When it comes up to skiing, Europe can offer a lot of skiing destinations. There’s everything for each type of skier: from the beginner to the off-piste junkie, from the snowboard dude to the après-ski fan, from the family with kids to the teenage group of friends, from the budget traveler to the spa-addict. Whichever ski destination you choose there will be something for you. This post has been last updated on 04 October 2018. 1 Then why choose Andorra for your next ski holiday? Then why choose Andorra for your next ski holiday? I have already been three times skiing in Andorra and I loved it. And if you ask me, I will go there a fourth time, not that I don’t like the rest of Europe’s ski areas, but I feel comfortable in Andorra. It simply feels like home. Or almost always. According to the statistics Andorra can brag the impressive 300 days of sunshine per year. Isn’t that a perfect reason to go skiing in Andorra? Tip: Do not forget your sun screen and sun glasses. At these heights the UV rays can be quite damaging to your skin and eyes. The 2 skiing areas Grandvalira and Valnord are located at average 2000 m (6500 ft), which complemented by the 1300 snow cannons guarantees perfect ski conditions throughout the whole ski season. Even late in the season the conditions are good. Tip: Go in March which is towards the end of the season – there’s enough snow, less people and the prices are more budget-friendly. Valnord is the smaller and less crowded of the two ski areas in Anodorra. It's mostly popular among families with children. The Pyrenees Mountains as seen from Soldeu - one of the resorts in the Grandvalira ski area in Andorra. You can see the ski runs in the distance. Andorra is one of the smallest countries in the world, and it’s on the 6th place in Europe with a territory of only 468 km2 (180 sq mi). I love the small alleys with stone houses. Andorra is popular for its fine examples of Romanesque architecture – there are more than 40 monuments and churches. The modern architecture strives to preserve this rural look: stone combined with wood. Tip: Take time to just walk around and enjoy the place. A ski holiday is not all about skiing, get to know the place. Andorra has a rich Romanesque architectural heritage. There are more than 40 churches and monuments dating back to the Middle Ages. If you look a bit further from the hotels and resorts in Andorra, you will discover that at some places the time has stopped ages ago. This is why I personally love Andorra. Although there come more than 10 million tourists per year and tourism has the biggest share of Andorra’s economy, it just doesn’t feel crowded on the slopes. The country hasn’t yet fallen into the trap of mass tourism. Tip: When skiing watch out for the ski schools and ski with caution. Well, when you are on a ski holiday, what you are mostly doing is being on the slopes the whole day. And if you want to take a day off, you are in no time in the capital Andorra La Vella. It’s fun spending half a day in the Grans Magatzems Pyrénées – a huge department store. There are of course a lot of other shops and boutiques. Tip: Andorra introduced in 2015 extra taxes, which makes the country nowadays less of a tax haven. This sculpture by Dalí symbolizes the passing of time. It is was donated to Andorra by Enric Sabater, art collector and friend of the artist. The inscriptions beside this monument reads: This monument represents the Contrapas Dance of Andorra la Vella. The Contrapas is a traditional dance, usually played during "La Festa Major" (the big festival - each Andorran town has such a festival). The dancers follow the instructions of the leader and always start with the left foot. A snapshot of the capital of Andorra - Andorra la Vella with Pont de Paris in the distance. Andorra la Vella is the highest capital in Europe at an elevation of 1023 m (3356 ft). Andorra is located in the Pyrenees mountains between France and Spain. You can fly either to Barcelona (Prat), Girona or Toulouse airports. There are direct bus services from all three airports. In Andorra you will be surrounded by mountains everywhere. The highest peak in Andorra is Coma Pedrosa - 2942 m (9652 ft). There are 2 skiing areas in Andorra, which are interconnected. Grandvalira is the bigger from the two. It has more than 200 km of ski runs and consists of the resorts Canillo, El Tarter, Soldeu, Grau Roig en Pas de la Casa. The other skiing area Valnord is relatively small – only 93 km of ski runs and three sectors: Arcalis, Arinsal and Pal. If you are into going out after a day of skiing and you like the night life, then Soldeu, Pas de la Casa or Arinsal are the best places for you. Valnord is more popular with families. I’ve tried both ski areas in Andorra, but my favourite one remains Grandvalira. 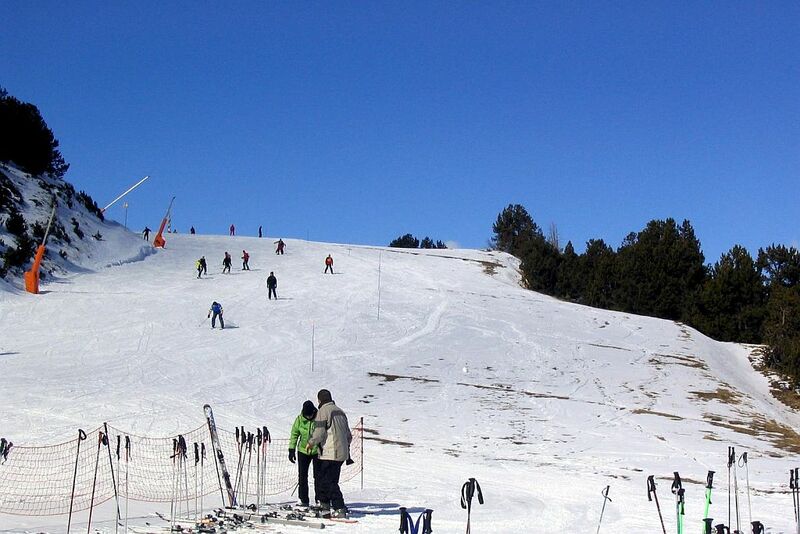 When we are skiing in Grandvali, we always choose for Soldeu. I just love this tiny place even after so many times. In Soldeu we always stay at Hotel Naudí. Read here why we always choose for this hotel and why I love it so much. DISCLOSURE: This post contains affiliate links, if you book your hotel via the link below I will a small amount at no extra cost for you. UPDATE: At this moment the hotel isn’t accepting any bookings. This post will be updated as soon as the situation changes. Until then you can find the best hotel deals on the website of Booking.com. Tip: When choosing a hotel, pay attention to the location/ It should be near to a lift that goes to the slopes, or it should provide free transport to a lift. Otherwise, you will be carrying your skis (or snowboard) around, and this is one part I personally hate. The less you need to walk in those ski boots, the better. Although Andorra is not a member of the European Union, the currency is the euro. The official language in Andorra is Catalan. However, Spanish, French and Portuguese are the other recognized languages. Having tourism as the main industry, everybody speaks also English. There are 109 lifts in Andorra with transport capacity of 156.000 skiers per hour. Andorra has also 6 snow parks and in Naturlandia you can do cross country skiing and snowshoeing. Have I made you long for the white slopes, dashing down like the wind? Do you feel like digging deep in your wardrobe and taking out your ski jacket? And then? Austria? France? Switzerland? Why not even Andorra? Just remember, Andorra is a ski destination where you can find all ski facilities and entertainment whiteout the crowds. It’s all clear, my favourite ski destination is Andorra and best place to stay is Soldeu. And what is your preferred ski destination? What makes it so special? Do you also think, that Andorra is a perfect place for skiing? Do you want to save this post for future reference or just spread the word about this up-and-coming ski destination? Pin it for later! Skiing in Andorra? Hotel Naudí has the perfect location and is full of character! I’ve been also 3 times to Andorra and it’s my favourite ski destination in Europe! I hadn’t even thought of skiing in Andorra, but of course they must have skiing since they are at such a high elevation. All those days of sunshine must make for some beautiful days on the slopes. You definitely convinced me, too bad both my partner and I work at a ski resort and taking time off during the season is not an option for us! I would love to compare with another realtively small and more offbeat destination (we live in Sweden and Sweden is not as popular as the Alps). I would still love to visit Andorra, I’m intrigued by small countries and haven’t been there yet. I really enjoyed my ski trip to Andorra – it didn’t seseem as crowded as the French alps and going via Barcelona meant we could also check out that city on the way! 300 days of sunshine, shopping (you had me at shopping by the way), and over 40 monuments and churches…I need to learn how to ski now. P.S. Your pictures are so pretty.